Home ＞ The Earthquake and the Nuclear Accident ＞ What Happened? The Great East Earthquake occurred at 2:46pm on March 11th recorded magnitude 9.0, has given tremendous damage to the northern part of Japan, especially in the prefectures of Fukushima, Miyagi and Iwate. 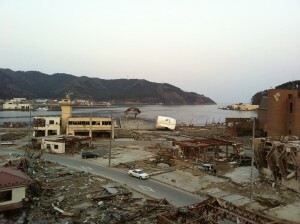 The earthquake and tsunami triggered the worst nuclear accident since Chernobyl. The Fukushima Daiichi nuclear power station located in the Pacific Ocean coast received huge damage by the earthquake and tsunami. The piping facility in the building, the facilities for the external power supply and backup power were destroyed. The next day, 12th in the early morning, the leakage of radioactive materials had been found in front of the main gate of the nuclear power plant. The steam was filled in the building by the core melt down caused by the dysfunction of the cooling system. Lots of radioactive materials were scattered in the environment thorough “vent” to reduce the internal pressure and the hydroponic explosions of the nuclear reactors. According to the estimates by Asahi newspaper based on the data from TEPCO, the amount of radioactive materials released into the air were 770,000 tera Bq until beginning of Apr.11,2011, and still going on with high risk. It is said that this amount is about 20% of the Chernobyl accident. On April 12th, 2011, Nuclear and Industrial Safety Agency raised the rate of the accident from level 5 to the level 7, the same level as Chernobyl. The government issued an evacuation instruction for residents within 3km radius in the beginning. 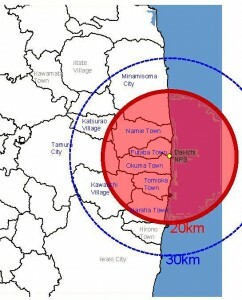 Eventually it was expanded to within 20km, and the residents of a range of 20km -30km were instructed to stay indoors. The movement of the radioactive plume and the information in the radiation dose based on SPEEDI (System for Prediction of Environmental Emergency Dose Information) was not released immediately. The target areas of evacuation had been decided based on the distance and reach of the radioactive plume from the plant rather than the actual radiation dose. In Minami Soma city, one of the regions that had been forced to stay indoors, the logistics for the region from outside was cut off automatically as a result of the order. The residents of the region lost the access to the supply of daily necessities such as foods, medicine, gasoline, etc. Though the immediate distribution of the iodine tablet after the nuclear accident is the conventional means for reducing the risk of thyroid cancer, Japanese government did not issue instructions to distribute the tablets for the residents. Some municipalities distributed the iodine tablets by their own decisions. There were also municipalities that did not even put out evacuation order even though high level of radiation had been measured there. The wide ranges of contamination had been identified through the Tohoku and Kanto region during 14th midnight to 15th. In the afternoon of the 16th, The U.S. government ordered its citizens to evacuate from 80km radius from the plant based on their own information obtained through US military’s surveillance activities. The contamination greatly differs based on the direction of the wind and the terrain rather than spreading concentrically. There were quite a few people who were evacuated to the areas which was more contaminated than their original place as a result of following the government’s evacuation order. The Japanese government had set 20 mSv per year as a standard value of public dose limit for radiation exposure in Fukushima and used the figure for specifying the evacuation zone. The government conveyed messages that there would be no harm by the effective dose less than 20 mSv per year. According to their calculation of indoor radiation exposure as 40% of that of outdoor, the government set the safe standard level as 3.8μSv / h based on the estimated annual dose. Also, in the government publications such as supplementary reading materials distributed in schools, the government mentioned that there is no clear evidence for the risk leading directly to the cancer by exposure of radiation less than 100 mSv per year. Those messages further confused the situation. This reference value of 20 mSv per year is said as very high figure for general public. There is a big difference between this reference value and the figure of Nuclear Industry Safety Regulations stipulated in 1972 in Japan, which determines that the cumulative dose for the workers (within the management area) must be limited under 20 mSv per year (must not exceed 50 mSv / year), and the cumulative five-year dose must be under 100mSv. It is prohibited for the general public to enter the controlled area which reaches 1.3 mSv radiation doses in three months. Workers are not allowed to eat and sleep at the area. Moreover, it is forbidden for pregnant women workers to exceed 2mSv cumulative radiation dose on abdomen during their pregnancy. When the Chernobyl accident occurred, the reference value of forced migration was more than 5 mSv per year in addition to the level of soil contamination. Many epidemiological studies pointed out that there is a possibility that cancer and other diseases also occur in low-dose radiation even it is less than 100 mSv per year. On April 29, 2011, Tokyo University Prof. Kosako resigned the councilor of the Cabinet Office, criticizing the use of the standard 20 mSv per year as reference for the safety level of schoolyards of elementary schools. He mentioned “It is unacceptable not only from an academic point of view, but also from my humanism to use this figure for infants and toddlers.” with tears. Despite of the rebellion from the member of the cabinet, still Naoto Kan, Prime Minister at the time continued to maintain 20 mSv. The municipalities of the coastal area close to the Fukushima Daiichi plant were evacuated to the other part of Fukushima prefecture as well as outside the prefecture. Nine municipalities transferred the office function itself. In the beginning, they used the gymnasiums as the evacuation center. Then, many of evacuees transferred to the inns and hotels, and lastly they moved in the temporary housings or the apartment paid by the government. At the evacuation centers, they just spread sleeping mats on the floor of gymnasium and there was no privacy. It was not barrier-free environment for disabled or friendly environment for women and small children. Although many of those shelters had been self-managed by leaders of the residents, but many of those leaders were elder men and in many cases there was lack of concern for women and children. The request from the young mother to secure space for the breast feeding was often ignored. As of December 2012, still around 100,000 people were displaced within Fukushima prefecture and 60,000 people have been evacuated to other prefectures. 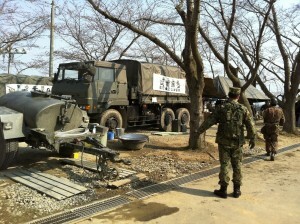 The relief efforts for the survivors of the earthquake and tsunami have been initiated by the Self-Defense Forces and the local fire brigade. 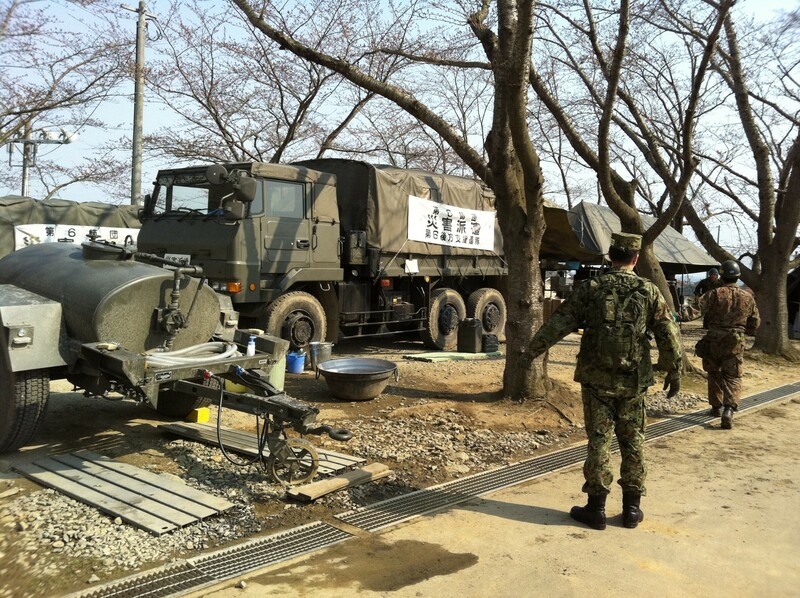 Defense Minister Kitazawa issued the command of sending 50,000 SDF members for the disaster relief work immediately after the disaster occurs, and the number was increased to 100,000 people by Prime Minister Kan the next day. Corresponding to that, the U.S. military began “Operation Tomodachi” for rescuing for survivors. Based on the criteria by the U.S. Nuclear Regulatory Commission (NRC), the activities of the U.S. military forces had been done in the area more than 80 km away from the Fukushima nuclear power plant. Therefore, they concentrated on Iwate Prefecture and Miyagi Prefecture and it did not work at Fukushima basically. 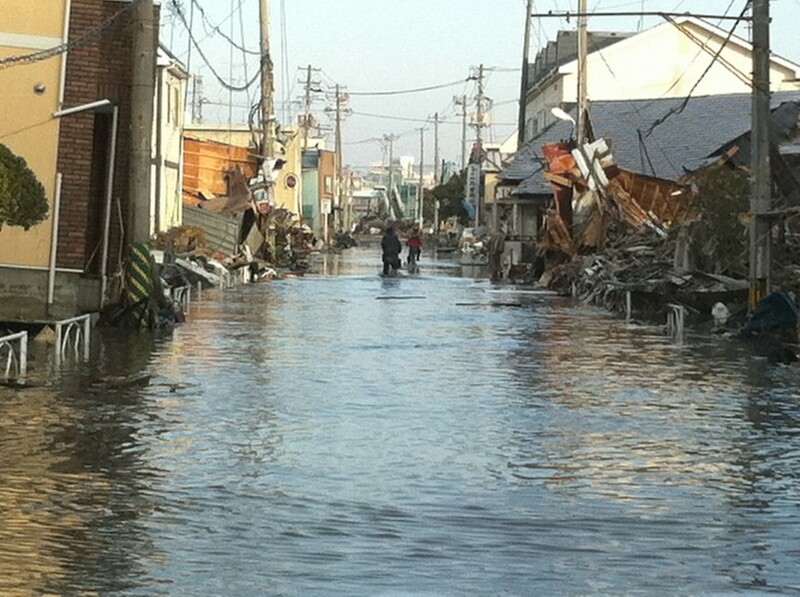 Compared to other disaster affected areas, there were less NGOs and general volunteers who entered Fukushima from outside the prefecture for relief work because of the fear of radiation. It was difficult to secure safety of staff. Minami Souma city withdrew the request of the general volunteer support even though it appealed once through YouTube. In terms of the activities of local CBOs and the general volunteer associations, the existing network of those organizations in Fukushima functioned effectively in the initial stage such as distribution of the relief supplies and emergency meal services. It needed a little more. The reactor of the Fukushima Daiichi nuclear power plant irrigation is continued to be poured water in order to maintain the current state of cold shutdown. The core fuels solidified after the melt down from Unit 1 to Unit 3, the spent fuels stored in the each storage pool and more than 1500 of the fuel rods which had been stored in the fuel storage pool of Unit 4 must be continued to cool down. No. 4 reactor did not have any fuels in the reactor due to the regular inspections at the time of the accident. However, even those spelt fuels generate heat even in the pool, so it become dangerous quickly if not continue cooling the spent fuel rods. The work towards the decommissioning has been accelerated by conducting rubble removal at the site concurrently with cooling down. The plan of the dismantling of the facility will be terminated over 30-40 years, but the decommissioning work has been hampered by difficulties in the very high radioactivity.In June 2012, the dosimeter was inserted by using the endoscope from the reactor building of Unit 1 to the first floor of the basement. In the basement, the level of the radiation recorded the maximum hourly 10.3Sv in 5m water depth. This was the figure that means the high probability of the death if a person exposes for one hour. By the fall of 2013 the installation of the huge cranes and building covers in Unit 4 and the removal of the fuel rods fuel from the pool is expected to start from December 2013. In any cases, the only work which can be started in the beginning is the removal of fuel rods from the fuel pool in each unit. There is no prospect about how to eject the melted down fuels in 1-3 Unit. The radioactive materials from the Fukushima Daiichi nuclear power plant are still leaking. Of course, the amount is small compared with at the time of the accident. However, it should be recognized as a “radiation leak accident” if it is in the normal case. 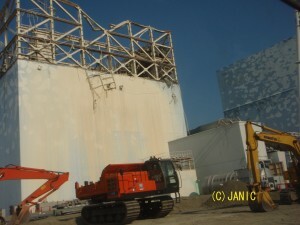 Most of radioactive materials are leaking from Unit 1-3 because of lack of the confinement function at the collapsed reactor building from Units 1-3. Still Release of maximum 10 million Becquerel’s per hour is continuing. 400 tons of groundwater per day was flowed into the reactor building and acuminated as contaminated water. 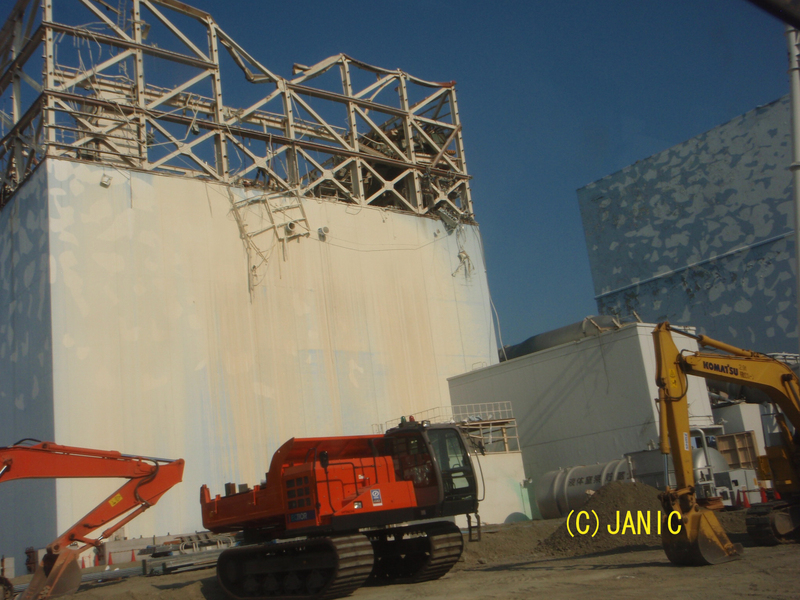 TEPCO has created a large amount of on-site storage tank to store the contaminated water. By November 2012, the well excavation begins in order to pump up groundwater before it is contaminated and flow into the sea. In the future, the contained water will be purified up to the level of no detection of radiation by the special equipment and release to the sea, according to TEPCO.